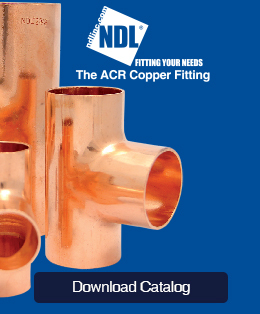 All fittings are designed for ACR specific applications. NDL stamps the size on each fitting; this greatly benefits the counter sales team ensuring correct identification. It also aids the contractor in the field once the fitting is removed from the box. NDL poly-bags the fittings before packaging them inside the box. It is important to the refrigeration system to keep the fittings clean; contaminants can cause expensive and destructive malfunctions. This organizational feature also saves time and money when clients count their inventory, they count boxes and not individual fittings. The NDL fittings have tight tolerances on the cup side. It enables clients to achieve a stronger joint with the tube and easier brazing. The NDL 10 Year “Ultimate Protection Warranty” will cover the loss of refrigerant and labor to replace the failed fitting. Such an occurrence has not occurred but NDL wants to provide the “Ultimate” in assurances. NDL does extensive 3rd party testing to ensure copper quality content and strict adherences to the ASME B16.22 Standards are respected and exceeded. When it comes to keeping refrigerant on the inside NDL has a track record of 16 years without a single failure. WE KNOW FITTINGS!